Michigan officials admit 57% of the Detroit vote-counting machines broke on Election Day, and there were 74,000 votes uncounted. Guess whose votes were not counted? You guessed it - Black and Brown votes! Trump won the vote by 11,612 votes. This is the same old Jim Crow System. Why do you think the Civil Rights Movement was fought? The Republicans want you to think that voter disenfranchisement is new, but it is not. White supremacists murdered, tortured, fired, and punished the generation who are now gray-haired witnesses for standing up for "one person, one vote". We won the victory, and now they are at it again! We will not allow them to take away our right of "one person, one vote". We are fired up! Civil Rights Warriors: Are you MAD yet? MAD enough to PROTEST this STOLEN ELECTION? Put your holiday plans aside for a minute to FIGHT for your future and for the future of our children. A Trump presidency will be a DISASTER for our people and our country. Keep the momentum going. Demand an AUDIT before Dec. 19th. Speak out, make phone calls, sign petitions, join rallies, support human and civil rights groups, educate your family and friends, and keep a compassionate, loving heart, while fighting fiercely for the values we cherish most. There comes a time when silence gives deadly consent. There comes a time when your silence speaks volumes about who you are as a human being. There comes a time when you must decide "which side are you on?" Which side are you on? History will write your answer for all eternity. 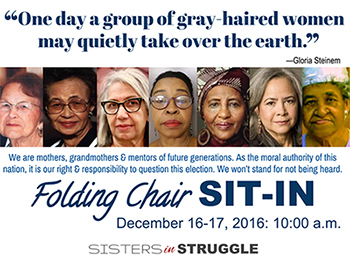 Mark your calendar: on Friday and Saturday, December 16th & 17th, 2016, a mighty cloud of gray-haired women called Sisters in Struggle (SIS) will converge on Philadelphia, as a radical non-violent folding-chair brigade who will sit in our chairs near People’s Plaza at Independence Mall. We will make it clear that this is OUR democracy. We refuse to allow Donald Trump and his cheerleaders to overthrow it by trampling on the right of every citizen to vote and to have our votes counted. We will sit and raise our voices to make sure that "one person, one vote" - which is the centerpiece of an authentic democracy - holds. Join us. 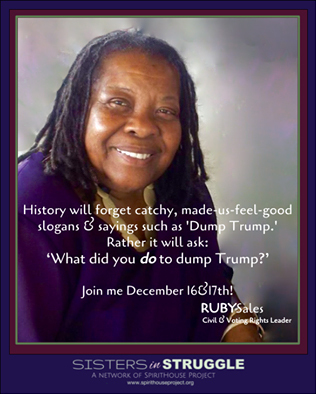 Write, fax, call, and do whatever you can to STOP TRUMP! NOW is the time to FIGHT! Our lives are at stake!